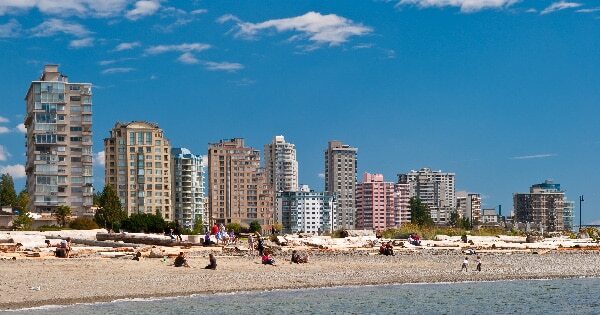 Vancouver is one of the premier tourist destinations in western Canada, if not the world. Places such as Stanley Park and the Robson Street shopping district, as well as events such as the 2010 Winter Olympics consistently draw visitors to Vancouver from far beyond Canada’s borders. However, Vancouver also offers attractions that are off the beaten path which offer appeal to interests ranging from literature to environmentalism. When you step onto SkyTrain you notice something unusual right away: no one is driving the train. SkyTrain is the longest completely automated light rail transit system in the world, providing service throughout the city of Vancouver, continuing to the surrounding communities of Burnaby, Westminster and Surrey. SkyTrain also provides service from downtown Vancouver to Vancouver International Airport and to the waterfront loading dock, where passengers can transfer to the ferry for the short trip across the water to Lonsdale Quay in North Vancouver, itself a popular tourist destination. Since 1988, thousands of literary-minded visitors from around the world have descended on Granville Island for the Vancouver International Writers and Readers Festival. Held annually over six days in October during the week after Canadian Thanksgiving, the Festival features author readings, panel discussions, interviews and performances in both English and French. In past years, featured authors have included J.K. Rowling, Salman Rushdie Alice Munro and Martin Amis. Tickets go on sale in September, and popular events such as the Poetry Bash regularly sell out well in advance. As a haven for naturists, Wreck Beach does not condone salacious activity. Explicit sexual activity is forbidden on the beach. Beach etiquette also strictly prohibits photographing or filming beach visitors without permission. West House is the result of a joint venture between Simon Fraser University, BC Hydro power company and various government agencies and commercial entities. It is a technologically advanced “smart home” of approximately 610 square that demonstrates how affordable housing, sustainable construction and environmentally-conscious landscape architecture work together on a compact footprint. West House was a showcase exhibit at the Yaletown LiveCity site during the 2010 Winter Olympics, drawing more than 60,000 visitors. Presently installed in downtown Vancouver, West House welcomed its first residents in April 2011. During this initial year-long tenancy, researchers will observe how the residents interact with the space, according to the Simon Fraser University website. Open houses are also planned at periodic intervals throughout the year.